Atlas copco compressed air filters, also called atlas copco line filters, are used to remove contaminates from compressed air after atlas copco compressor compression which will generally have a high water content, as well as a high concentration of oil and other contaminants. Knowing the needs of your compressed air system and choose the right filter. Whether your air need a high level of filtration or basic contaminants removed, cleaning your air is an important step in the compressed air process. Our Atlas copco compressed air filter replacement offers effective solution for filtering particulate and moisture in your airline. Check out the following Atlas Copco’s compressed air filter to find the original part number and contact us for more information. 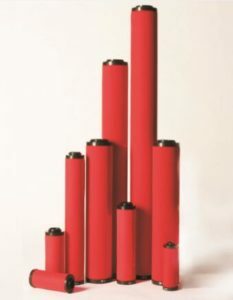 The DD (DDp) range of coalescing filters : general-purpose protection, removes liquid water and oil aerosols to 0.1 mg/m³ (0.1 ppm) and particles down to 1 micron. The PD (PDp)range of high efficiency coalescing filters: remove liquid water and aerosols to 0.01 mg/m³ (0.01 ppm) and particles down to 0.01 micron. The QD range of active carbon filters is used for hydrocarbon odours. removes maxoil aerosols to 0.003 mg/m³ (0.003 ppm).